For a New Year's Eve celebration that offers seemingly endless amounts of fun, entertainment, and activities, head to Myrtle Beach to welcome in the year 2018. With numerous events taking place all along the Grand Strand, you are sure to find a celebration that is just right for you! Make it a medieval New Year's Eve when you attend this stunning dinner and show at Medieval Times, located at Fantasy Harbour in Myrtle Beach. This two-hour live event will include hors d'oeuvres, admission to the Museum of Torture, four course feast, party favors, music and dancing, champagne toast at midnight (non-alcoholic beverage will be served to minors), and midnight countdown with balloon drop. You'll get to experience the show you love with an added bonus of NYE swag! Make your reservations today to take part in this unique New Year's Eve event. Stop by Broadway at the Beach on December 31st for numerous specials to experience as you count down the hours remaining in 2017! The fun starts at 7pm for those 21+, who should make their way to The Village, Broadway's Nightclub District. Celebrations Nitelife will host a rocking NYE party at their three establishments, Malibu's Surf Bar, Broadway Louie's, and The Oz Experience. All three locations will feature live music, party favors, champagne toasts, live balloon drops, and confetti canons! Head to the center of Broadway before 8pm, when a thrilling fireworks display will be set off over Lake Broadway, then retu to the fun as you await midnight. From 10pm-2am, join the celebration at Hard Rock Cafe, where you can get in the door for $35 per person (in advance). Once inside, enjoy a complimentary hors d'oeuvre buffet, live simulcast from Times Square in NYC, ballon drop, party favors, and confetti canons. VIP packages can be purchased to guarantee seating, champagne, reserved viewing for the fireworks, and a four-course meal. Ring in the new year in style when you celebrate at Broadway at the Beach! This New Year's Eve celebration is just for the youngsters in your group! From 8pm on December 31st to 8am on January 1st, children ages 6-14 can attend the Ripley's Aquarium NYE Sleepover for the price of $49.99. Kids will enjoy karaoke, crafts, pizza, movies, music, dancing, ball drop, non-alcoholic midnight toast, and a live simulcast from Times Square in NYC! Reservations are required for this special, kid-friendly event, so reserve your child's spot today! If you're looking to enjoy a late-night out on the town, this is the perfect place for your kids to have a great time while being cared for and supervised by the amazing organizers at Ripley's Aquarium! 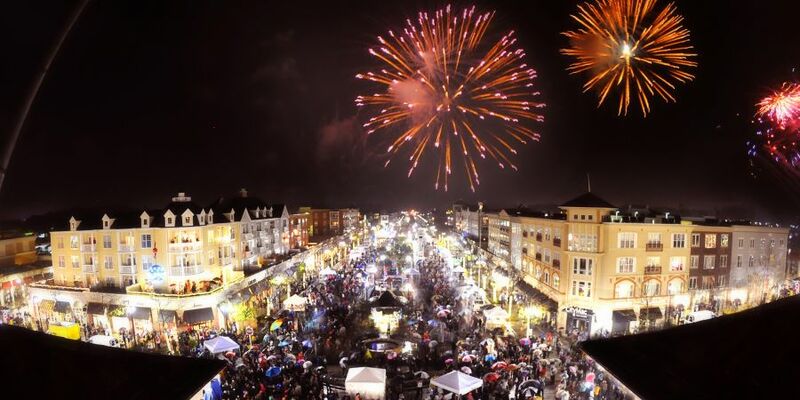 Head over to Market Common for a Southe twist on New York's Times Square NYE celebration. Admission is free to this family-friendly event, which gets underway at 7pm on December 31st. The event will be live-streamed by HTC starting at 9pm and displayed on a jumbo screen at the Market Common. Guests will enjoy live music from two different stages on the premises, which will also feature a beer garden offering food and beverages. The shopping district's retailers and restaurants will also be open during the event, with stores closing at 9pm. Visitors can interact with human statues, mimes, glass blower, face painters, and get glitter tattoos! There will be dancing in the streets, inflatables, and kid-friendly games, so bring everyone in your group along for this fantastic celebration. Watch the mirror ball drop as you count down to midnight, and be amazed by one of the area's only midnight fireworks displays. Large purses and backpacks are prohibited, so plan ahead to make this event an enjoyable night of celebration. Travel south to Brookgreen Gardens for an early New Year's Eve celebration to get the rest of your night started! This Garden By Candlelight Pre-Party takes place from 6pm-9pm, during which time the sculpture garden will be open and displaying thousands of hand-lit candles, holiday music, and dazzling lights. Tickets are required, and light refreshments will be available for purchase during the event. To get your NYE off to an ideal start, join the Pre-Party at Brookgreen Gardens before heading out for a night of celebrations! Barefoot Landing offers up guests entertainment, shopping, and dining all year long, and on New Year's Eve, they take it up a notch. The fun begins at 6pm, with a fireworks show over Barefoot, followed by a variety of special NYE dinners and/or party celebrations to ring in the New Year. Greg Norman's Australian Grille at Barefoot Landing will open at 4:30pm and offer fine dining, live music, party favors, and a champagne toast at midnight. The band Surfside will provide live music from 8pm to 1am. Reservations are recommended to these special celebrations. Experience New Year's Eve at Myrtle Beach's hottest music and concert venue, the House of Blues! This year's New Year's Eve Dinner and Dance will feature music from Corey Smith, as well as a four-course meal to help you ring in the New Year! NYE event tickets will also include discounted rates to other HOB events, as well as a gift certificate for two concert tickets to the show of your choice in 2018. Don't miss out on this musical celebration, which is sure to help you rock your way into 2018! Whether you choose to party the night away at Broadway at the Beach, enjoy live music at House of Blues, or stick to the traditional ball drop at Market Common, you are certain to find the New Year's Eve event that is perfect for you and your group during your stay in Myrtle Beach. Enjoy the last hours of 2017, and start 2018 with a bang on your holiday beach vacation!